Enjoy more than just tea with Gourmia GDK290 Glass Electric Tea Kettle. With this adjustable appliance, you can boil water at just the right temperature for making tea, oatmeal, noodles or cocoa. It comes with a programmable temperature pedestal control panel. The kettle is made with a unique feature which a steeper tea infuser which lets you raise or lower the tea strainer for optimum temperatures. It is a one of a kind which can hold two quarts of volume. Gourmia is a trusted brand which takes the quality of its products seriously. The Kettle is ETL certified so you can be confident that you are getting maximum safety, quality, and high-efficiency appliance. This Gourmia tea kettle is made of transparent glass that allows you to clearly see how much water or liquid is left in the kettle for easy refilling. The clear level markings make it easier for you to measure out the right amount of water for servings and making tea. The cordless detachable base of this kettle allows for easy maneuvers of the kettle. You can carry it wherever you please to pour liquids. It has a unique built-in steeper tea infuser which allows you to warm tea while boiling water. 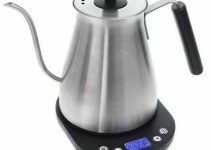 It allows for customization of flavor without necessarily opening the hot kettle. The infuser is built in such a way that you can raise its stance allowing for steaming and boiling and, is also removable in case you want more volume in the kettle. It has in-built temperature controls at the bezel of the kettle that allow you to set the preferred temperature of liquids. You can make more than tea by regulating water temperature and use it to boil water for oatmeal and noodles. Quality- the outward appeal of the kettle gives off an impression of quality. Made from glass and stainless steel, it adds on its aesthetic value. The in-built tea steeper as an extra feature also attracts customers. Fast- it can boil liquids relatively fast. It can boil 1.7 liters of water in about six minutes. The interval for setting temperatures is also ideal at five degrees Fahrenheit. This is very efficient compared to other electric kettles which have an interval setting of 10 degrees. Informative signs- it beeps when the liquid temperature set by the controls is reached. It can remember the last temperature setting provided it is not unplugged. It can still remember the setting if you switch it off. Easy to clean- with the detachable base and removable infuser, the kettle can be easily cleaned. Smudge and stains can be removed from the glass and stainless steel with ease using steam. Read more about how to clean o kettle. Programmable- it can keep the temperature of liquids for as long as two hours with programmable temperature settings. Metal strainer- it includes a metal strainer that can be used to brew loose leaf beverages. It can also sieve particles in liquids being put into the kettle. Like other electric kettles, it cannot be fully submerged when cleaning. Storage of this kettle can be problematic as the cord does not retract all the way into the base of the kettle. There is no guarantee of BPA testing as such the plastic lid’s contact with liquids can cause produce toxins after prolonged use. It does not keep liquids at the advertised keep-warm temperature for two hours. It occasionally shuts off at various intervals. Some customer reviews suggest that the bottom of the glass pitcher is defective, does not seal well and leaks. It is not full-proof efficient as the plunger for the tea steeper allows for loss of heat in the form of steam, when it is removed. Gourmia electric kettle has more positive customer reviews hence certified among the best in safety and quality standards. It is very convenient to use with a provided instructional manual and specifications of the inbuilt diffuser for making tea. Gourmia has made a leap in advancements by ensuring easy cooking of healthy and delicious beverages. Do you like my review? Show me some love and hit the social share buttons from the left. It will be much appreciated. Also, leave a comment below, and don’t forget to search the site for other reviews too!